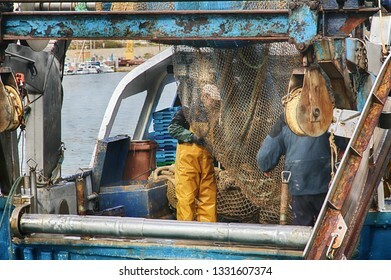 4,696 stock photos, vectors, and illustrations are available royalty-free. 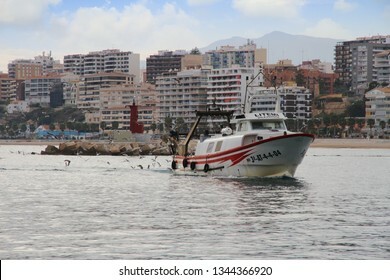 ALICANTE - SPAIN. 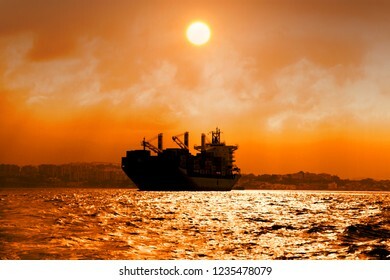 June 30, 2016. 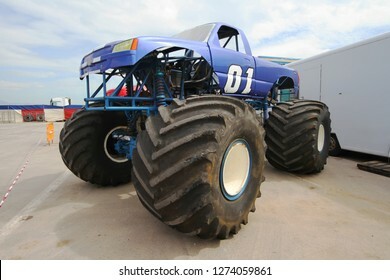 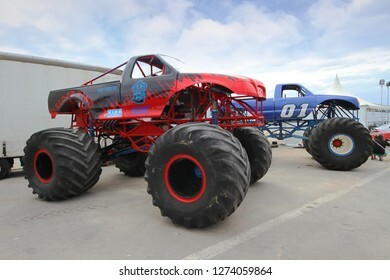 Monster truck and races festival during the summer. 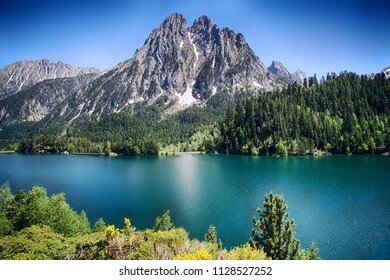 Alpine lake of San Mauricio inthe Aigues Tortes National Park in the Spanish Pyrenees. 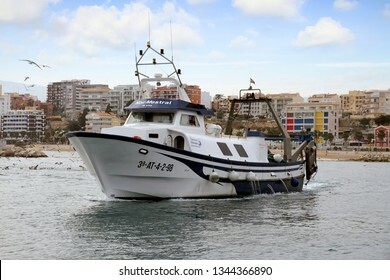 VILLAJOYOSA, SPAIN – MARCH 06, 2019. 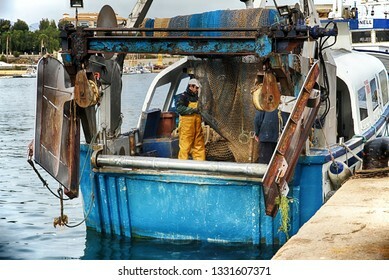 Fishermen of trawler fishing boat crew cleaning nets in the port of Villajoyosa in Spain. 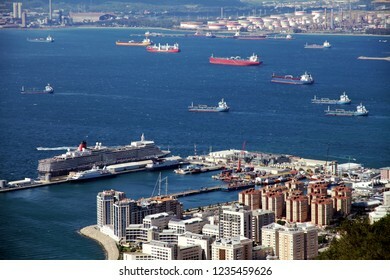 ALGECIRAS, SPAIN. 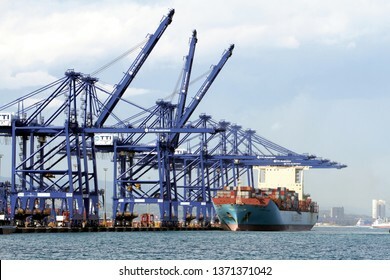 SEPTEMBER 11: Containership NORFOLK TRADER entering in the port of Algeciras; on September 11, 2018 in Spain. 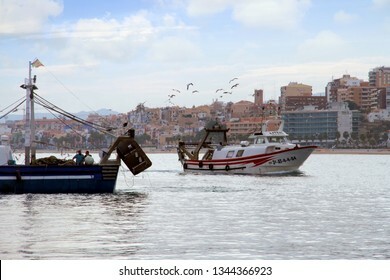 VILLAJOYOSA, SPAIN – FEBRUARY 21, 2019. 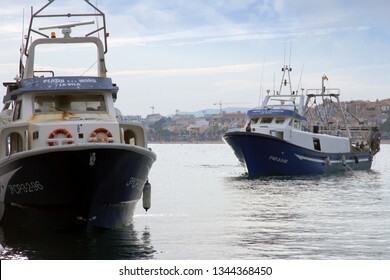 Arrival of Trawler fishing boats fleet of Villajoyosa base in the Mediterranean Sea in Spain. 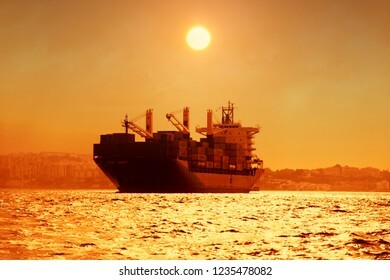 Container ship anchored in Algeciras bay during the sunset. 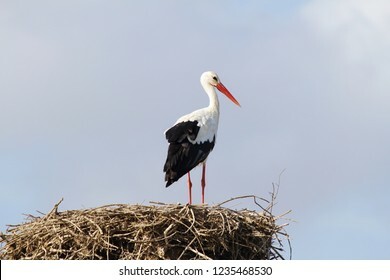 Stork above a nest placed on a electric tower. 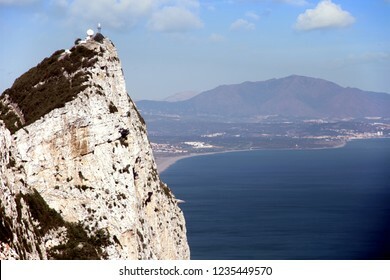 View of the Mediterranean Sea and the Rock of Gibraltal in a sunny day from the top of the cliff. 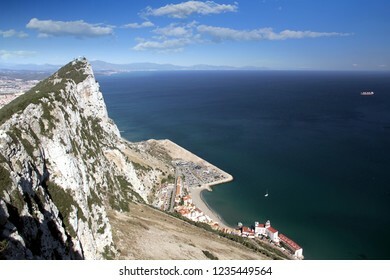 GIBRALTAR - UNITED KINGDOM. 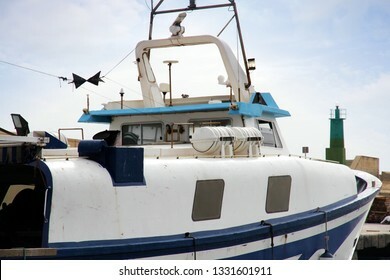 SEPTEMBER 01, 2011. 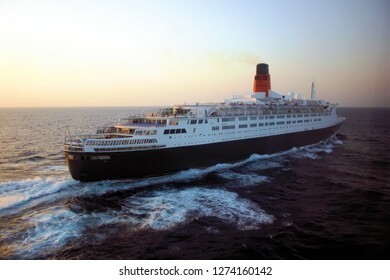 Great cruise QUEEN ELIZABETH II in open waters close to the Rock of Gibraltar in United Kingdom. 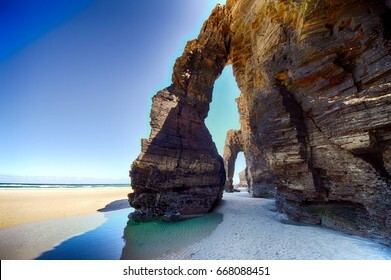 Cliffs and rocks during low tide in Cathedrals Beach in northern Spain. 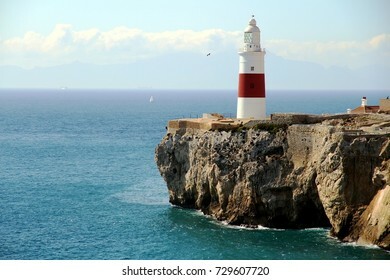 TARIFA, SPAIN – SEPTEMBER 08, 2018. 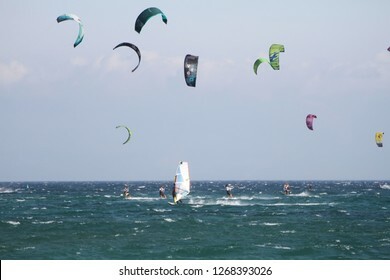 Windsurfers and kitesurfers sailing fast and jumping across the Los Lances Beach in the west coast of Tarifa Village, in Cadiz. 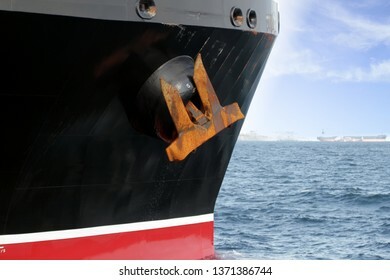 Detail of great iron anchor stored in the bow of a petrol tanker. 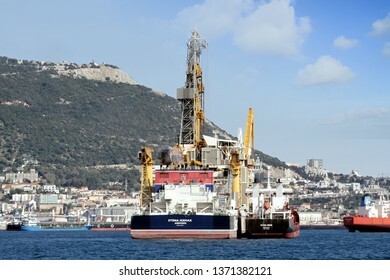 ALGECIRAS, SPAIN - MARCH 23, 2019. 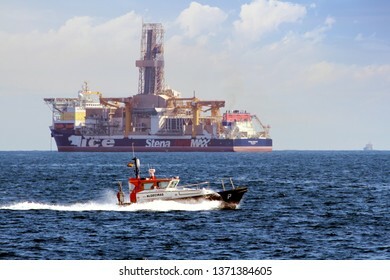 Pilot cutter of Algeciras harbor sailing close to drillship Stena Icemax in Algeciras bay. 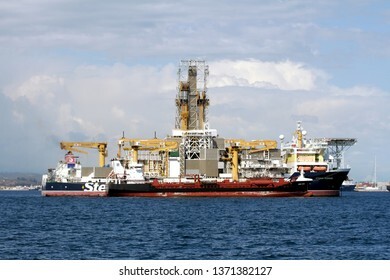 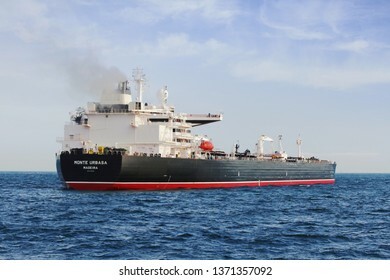 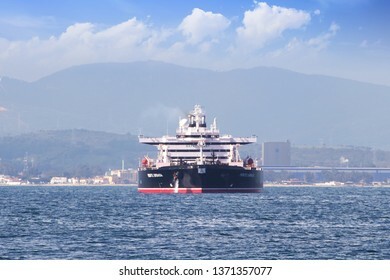 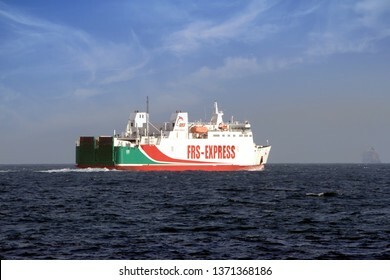 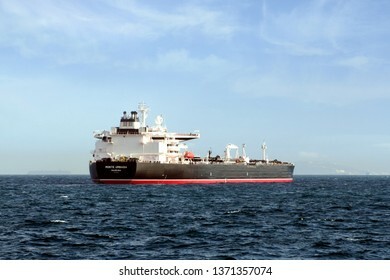 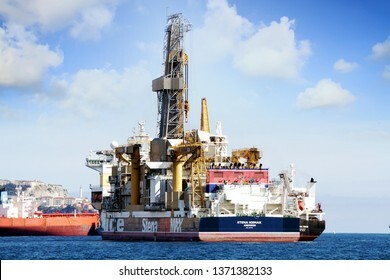 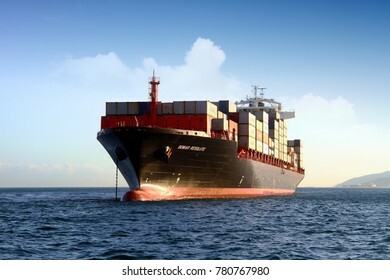 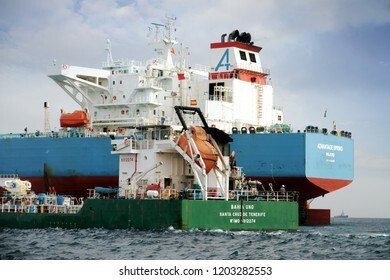 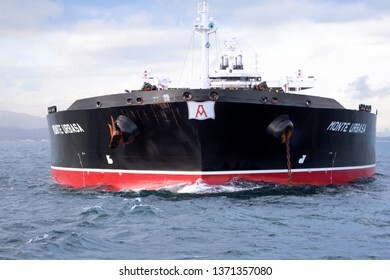 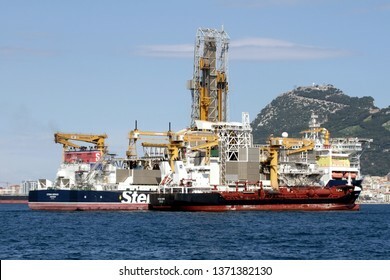 ALGECIRAS, SPAIN – MARCH 24, 2019.. Drillship Stena IceMax, the world’s first dynamically positioned, dual mast ice-class drillship anchored close to Algeciras bay, in Cadiz. 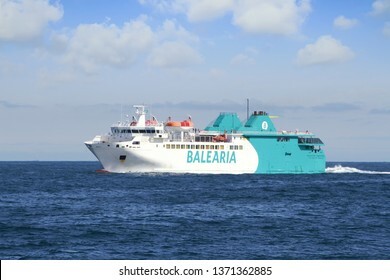 ALGECIRAS, SPAIN – march 21, 2019. 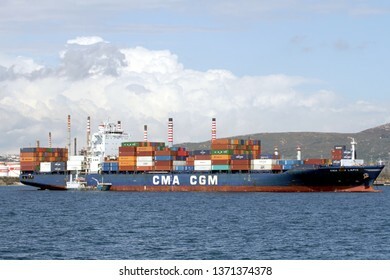 The container ship CMA CGM LAPIS waits anchored close to the port of Algeciras for download containers on harbors quay in Cadiz. 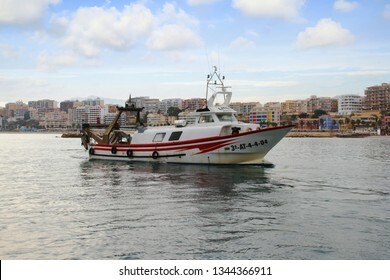 ALGECIRAS, SPAIN – MARCH 20, 2019. 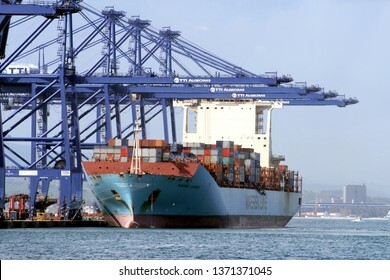 Great container ship MAERSK LAVRAS working with containers handling gantry cranes in the ITT Terminal in the port of Algeciras in Cadiz. 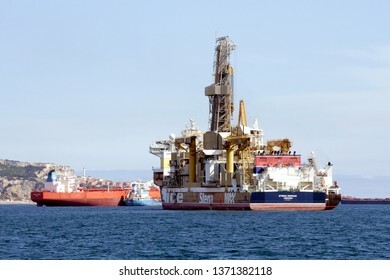 ALGECIRAS, SPAIN – MARCH 23, 2019. 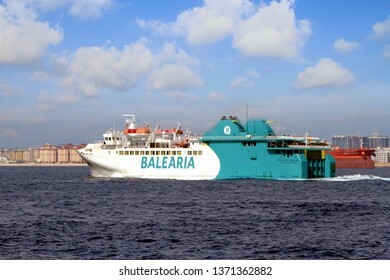 Ferry Poeta Lopez Anglada of Balearia Lines leaving Algeciras bay, in Spain. 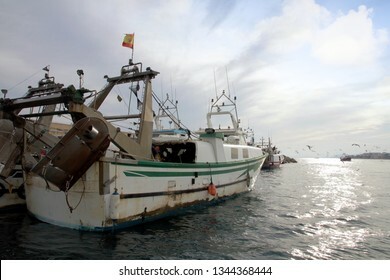 ALGECIRAS, SPAIN – MARCH 23, 2019. 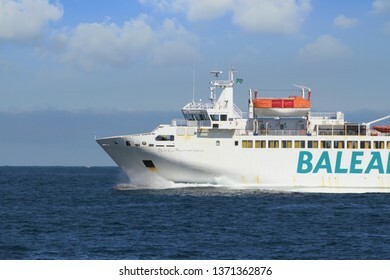 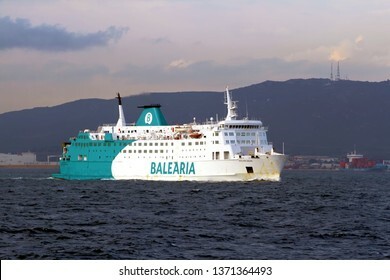 Ferry Passio per Formentera of Balearia Lines entering in Algeciras bay, in Spain. 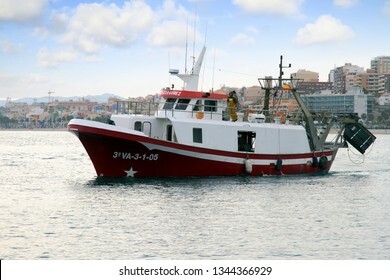 ALGECIRAS, SPAIN – MARCH 23, 2019. 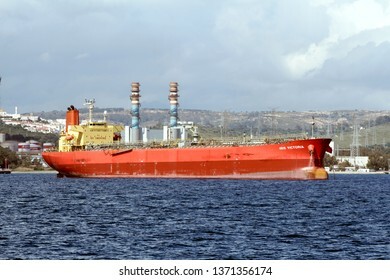 Container ship MUSTAFA DAYI leaving the port of Algeciras in Cadiz. 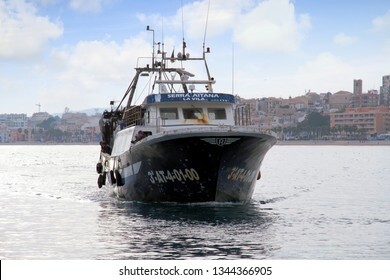 ALGECIRAS, SPAIN – MARCH 23, 2019. 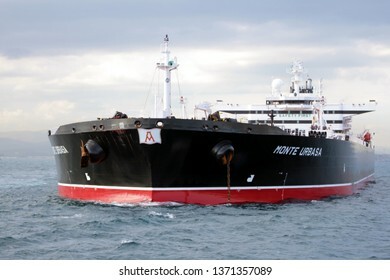 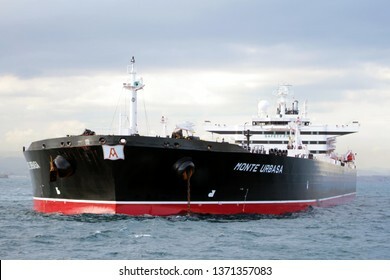 Monte Urbasa petrol tanker anchored close to the port of Algeciras and the rock of Gibraltar, in Cadiz. 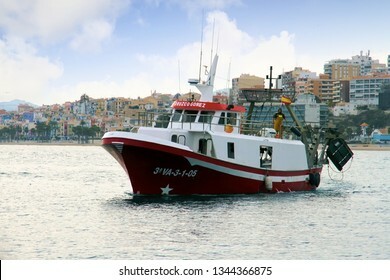 ALGECIRAS, SPAIN – MARCH 23, 2019. 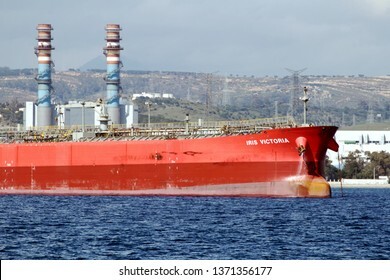 Iris Victoria petrol tanker anchored close to the port of Algeciras and the rock of Gibraltar, in Cadiz. 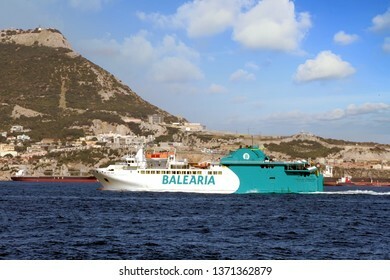 ALGECIRAS, SPAIN – SEPTEMBER 25. 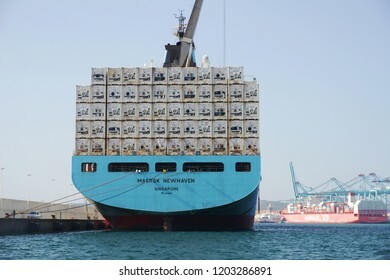 The container ship MAERSK NEWHAVEN docked in auxiliary pier waiting for download refrigerated containers in the port of Algeciras, on september 25, 2018 in Cadiz. 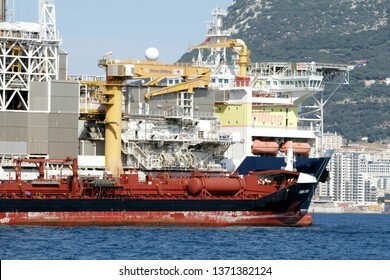 ALGECIRAS, SPAIN – SEPTEMBER 29: Big Petrol tanker ADVANTAGE SPRING anchored in Algeciras Bay join to supplies vessel BAHIA UNO close to Gibraltar Rock, on september 29, 2018 in Cadiz. 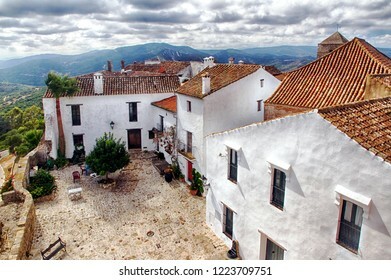 TARIFA, SPAIN – SEPTEMBER 30. 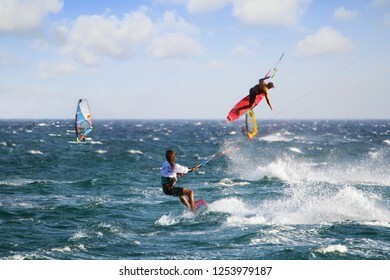 Kitesurfer jumping in the beach of Tarifa in Spain on September 30, 2018 in Cadiz. 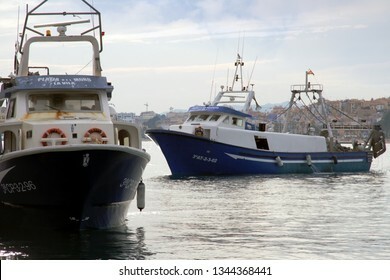 TARIFA, SPAIN – SEPTEMBER 08, 2018. 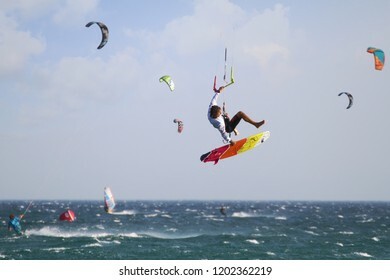 Windsurfer sailing fast and jumping across the Los Lances Beach in the west coast of Tarifa Village, in Cadiz. 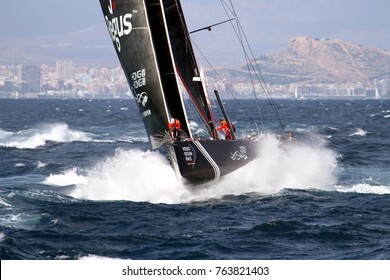 ALICANTE, SPAIN - OCTOBER 22: Team CLEAN SEAS dworking hard agains waves under the lighthouse of Santa Pola Cape, on October 22, 2017 in Alicante. 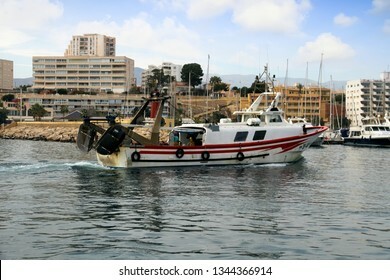 ALGECIRAS, SPAIN – AUGUST 15. 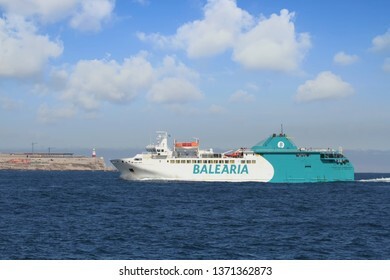 The container ship BOMAR RESOLUTE anchored and waiting for enter in the port of Algeciras to load containers, on august 15, 2017 in Cadiz. 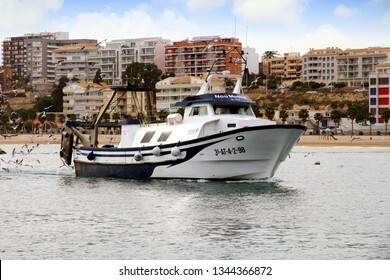 Dragnet fishing boat sailing in Algeciras Bay in Spain. 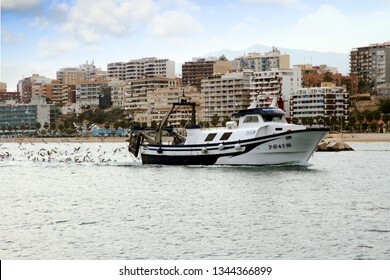 ALICANTE, SPAIN. 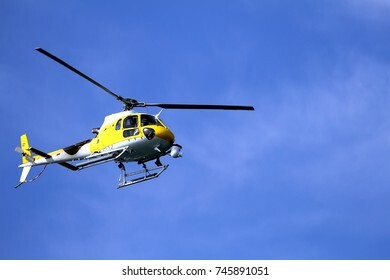 October 22, 2017. 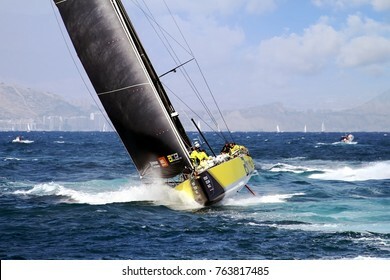 Team Brunel moments after start Leg 1 Alicante-Lisbon of the Volvo Ocean Race 2017-18 one of the most exciting start we've seen from Alicante. 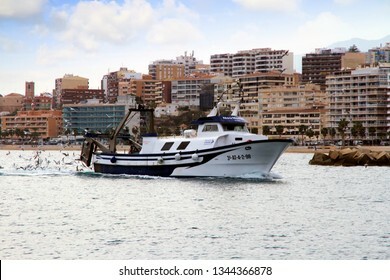 VILLAJOYOSA, SPAIN – MARCH 07, 2019. 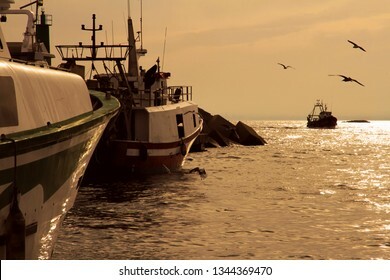 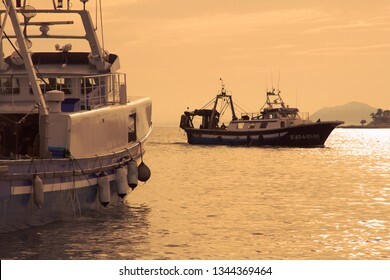 Arrival of trawler fishing boats at sunset after a journey fishing along the coast of Alicante province in the Spanish Mediterranean Sea. 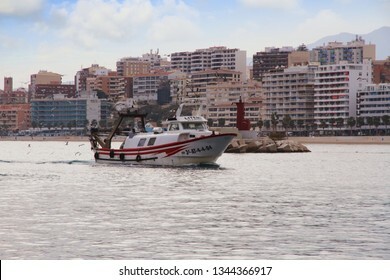 VILLAJOYOSA, SPAIN – MARCH 07, 2019. 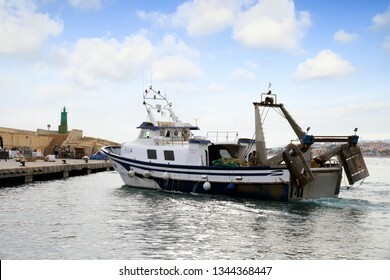 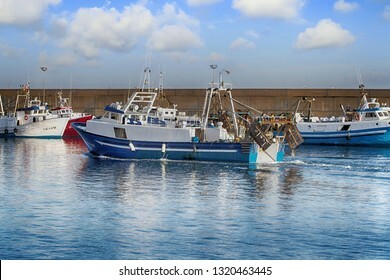 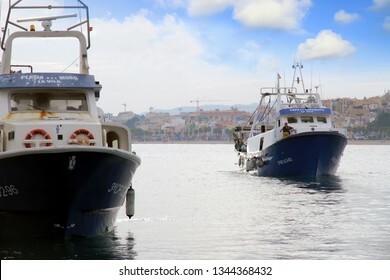 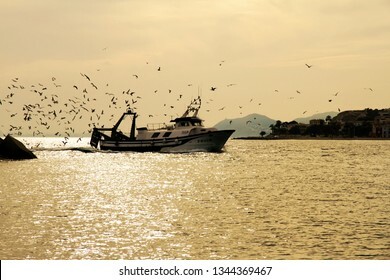 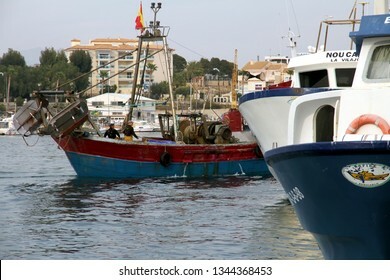 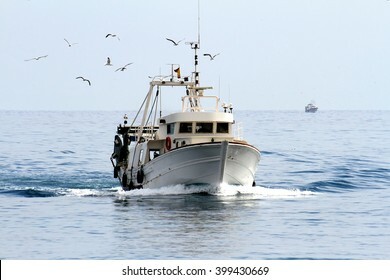 Trawler fishing boats maneuvering to be docked after a journey of fishing in the port of Villajoyosa in the Spanish Mediterranean Sea. 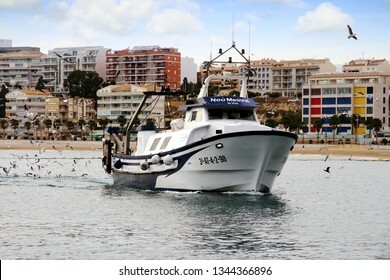 VILLAJOYOSA, SPAIN – MARCH 07, 2019. 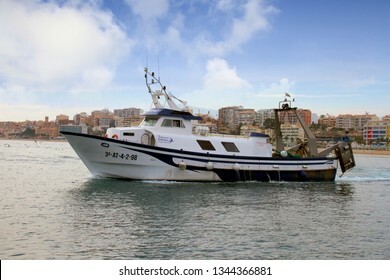 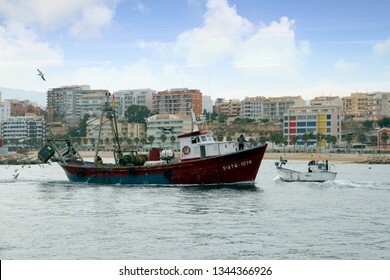 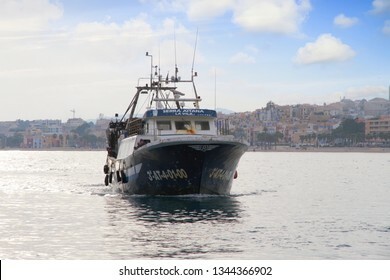 Arrival of trawler fishing boats after a journey fishing along the coast of Alicante province in the Spanish Mediterranean Sea. 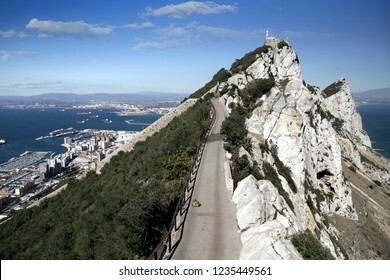 GIBRALTAR, UNITED KINGDOM - OCTOBER 04, 2018. 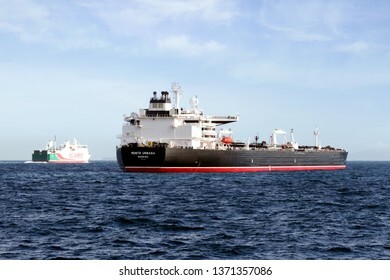 Lots of tankers and containers ships anchored joint to the Port and city of the Rock of Gibraltar in United Kingdom. 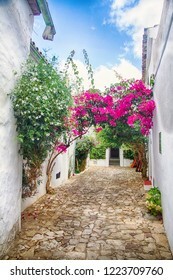 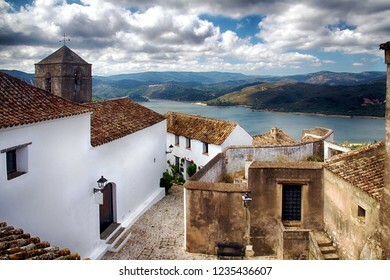 Village of Castellar de la Frontera, typical street with flowers in the white facades, in Cadiz. 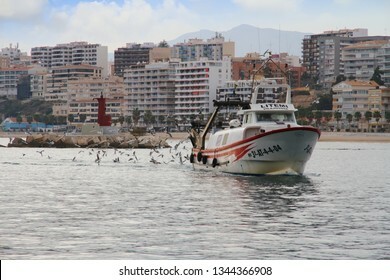 ALICANTE, SPAIN. 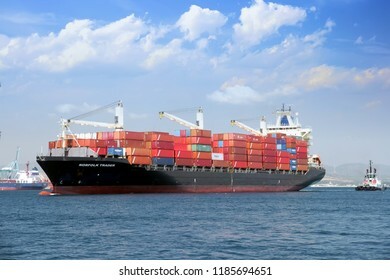 October 22, 2017. 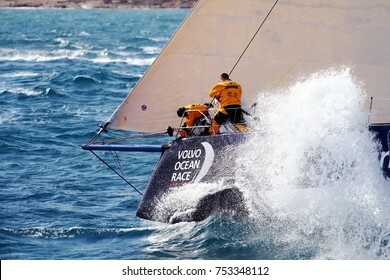 Team Scallywag moments after start Leg 1 Alicante-Lisbon of the Volvo Ocean Race 2017-18 one of the most exciting start we've seen from Alicante. 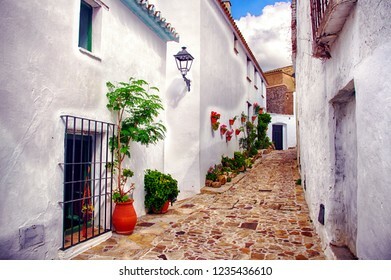 Castellar de la Frontera, typical street with flowers in the white facades. 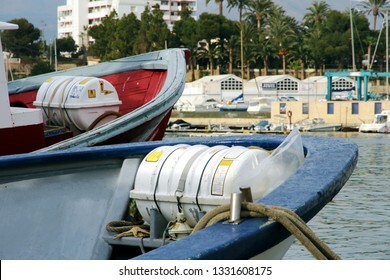 ALGECIRAS, SPAIN – SEPTEMBER 18, 2018. 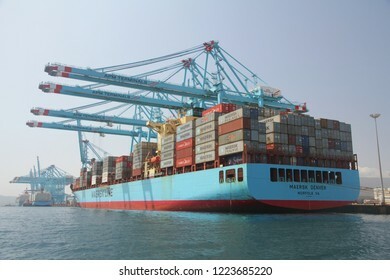 Great container ship MAERSK DENVER working with 4 containers handling gantry cranes in the ATM Terminal in the port of Algeciras. 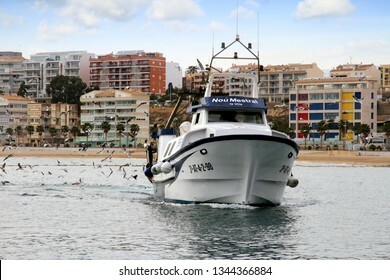 VILLAJOYOSA, SPAIN – MARCH 06, 2019. 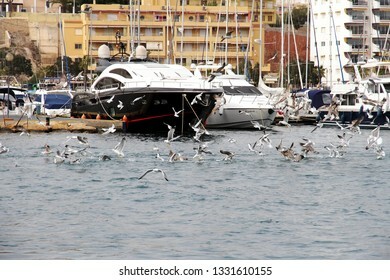 Seagulls catching the fish that are rejected by the fishermen that enter the port of Villajoyosa in Spain. 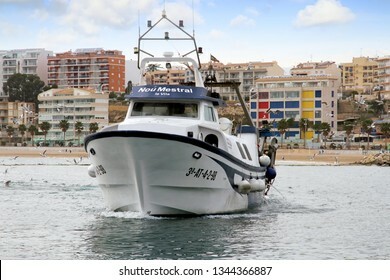 VILLAJOYOSA, SPAIN – MARCH 06, 2019. 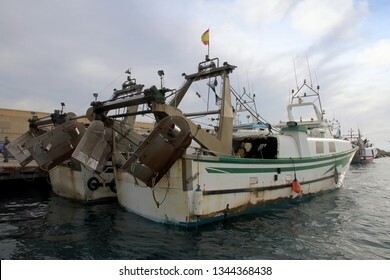 Bow of two trawlers docked at the port of Villajoyosa in Spain. 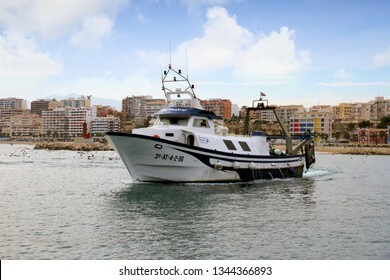 VILLAJOYOSA, SPAIN – MARCH 06, 2019. 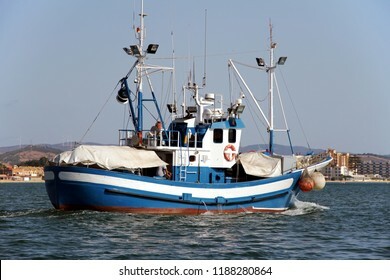 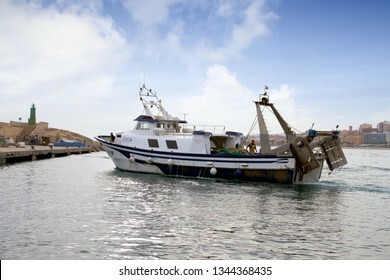 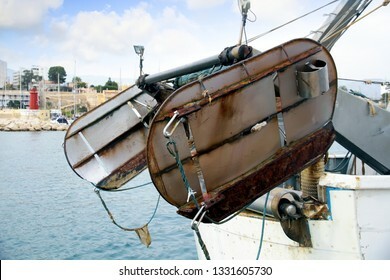 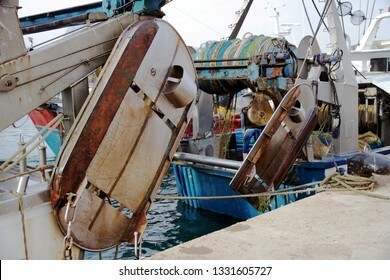 Steel doors in the stern of a trawler moored in the fishing port of Villajoyosa in Spain..
VILLAJOYOSA, SPAIN – MARCH 06, 2019. 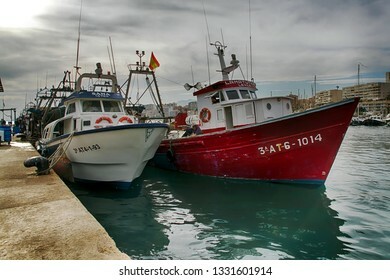 Trawler fishing boats docked after a journey of fishing in the port of Villajoyosa in the Spanish Mediterranean Sea.